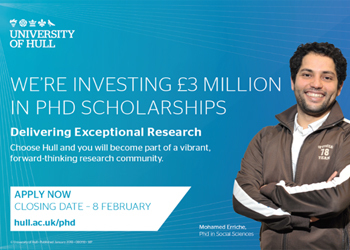 At the University of Hull we are continuing to witness the real-life impact that our research has as well as seeing a significant increase (by 35%) in the number of competitively won research grants in the last academic year. To build on this success, the University has committed a further £3 million in over 50 PhD scholarships, to attract the best academic talent to tackle a range of issues, from exploring cultures through music and language to the stresses placed on our oceans as a result of climate change and pollution. The scholarships will cover successful students' tuition fees as well as their stipendiary living costs, totalling around £19,000 per year.